From an early age Jean Baptiste Bourguignon d'Anville (1697-1782) was immersed in the study of geography and cartography. He engraved his first map at age fifteen and produced many important maps throughout his career. He became one of the most respected cartographers of his time, continuing the French school of cartography developed by Sanson and De l'Isle. 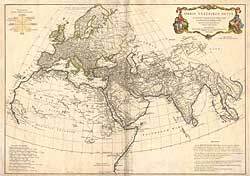 He was also a classical scholar, with many of his maps relating to ancient geography. from the best antique map price guide available anywhere!